Pre-eclampsia: What is it all about? For most of us, pre-eclampsia is just a rise in the blood pressure of a pregnant woman. There are other symptoms related to pre-eclampsia that go unnoticed. 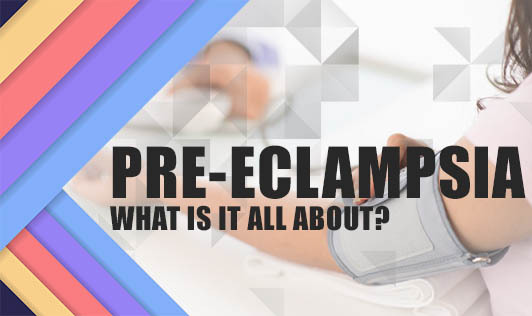 Read below to get an overview of pre-eclampsia. Although it is difficult to predict who can get pre-eclampsia during pregnancy, you are at greater risk if you have had it before, or if your mother or sisters have had it. If it's a first pregnancy, or the first pregnancy with a new partner or pregnancy above 35 years of age, your risk of getting pre-eclampsia increases. Multiple pregnancies, and any chronic illness like high blood pressure, diabetes, kidney problems and migraine can increase your risk of pre-eclampsia. Pre-eclampsia can progress to eclampsia. Convulsion, the main symptom of eclampsia, is generally seen before a shoot up of your BP or after delivery. Kidney failure or HELLP syndrome (group of symptoms related to liver) can be a few other complications. Pre-eclampsia can also lead to premature births along with growth problems in the child. Until recently, an early caesarean delivery to stop pregnancy was the only known treatment for pre-eclampsia. Doctors now, try a variety of methods like strict bed rest and a few drugs to lower high blood pressure to allow complete development of the baby. Injecting magnesium sulphate can halve the risk of pre-eclampsia progressing to eclampsia. Do not ignore any unusual symptoms during pregnancy to reduce complications. Keep your Doctor informed about the changes in your body.